Funded by the National Science Foundation, the documentary takes Alley to many places and countries, including New Zealand. He dwells on the human need for energy, the kind of energy demands a growing population will make, and the ultimate inability of fossil fuels, a limited resource, to meet that demand even if we could carry on burning them with impunity. But we can’t, and Alley explains why. A visit to the Franz Josef and Tasman glaciers, with some great photography, is part of what he uses to explain the real world impact of changing levels of CO2. A fascinating visit to the national ice core laboratory in Denver, Colorado demonstrates that today atmospheric CO2 is at a level not seen in cores that go back as far as 400,000 years — far above them, in fact. Then it’s back to New Zealand as, against the background of Rotorua thermal activity, Alley explains the isotopic evidence that backs up the relative volume measurements to confirm that the increased CO2 is the result of burning fossil fuels, dwarfing natural volcanic processes. The naval officer interviewed who has special responsibility for the issue has no doubt about the reality of climate change. The only uncertainties he sees remaining are in the likely impacts in specific regions. He speaks of the significant implications for naval bases of sea level rise, speaking of one or two metres. I couldn’t help wondering while watching this section what the deniers in Congress make of the fact that their military are convinced by the science and are preparing for what’s ahead, as well as involving themselves with the solution side of the issue through renewable energy. They aim to cut usage of fossil fuels by 50 per cent by 2020. Alley uses the military engagement with alternative energy options as a bridge to the latter part of the documentary which offers an optimistic assessment of a clean energy future. He goes first to China, which, he says, like the US military is moving ahead full speed on multiple, different sustainable energy options. He notes how much more money China is committing to research into wind, solar and other clean energy technologies than is the US. There follows a survey of renewable energy sources showing that they are adequate many times over to human needs. 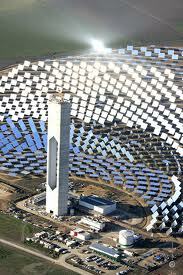 Solar power in Spain, wind power in Texas, geothermal power in New Zealand are among the illustrations he offers. The documentary is well worth the hour’s viewing. It is upbeat and optimistic in spite of its realism about climate change. Maybe more hopeful than can be justified for those who watch the politics of climate change with dismay. But it’s agreeable to watch it and imagine its advocacy coming to fruition within the time available. And it’s certainly good to be reminded of that face of America which has a positive will to deal with the problem.